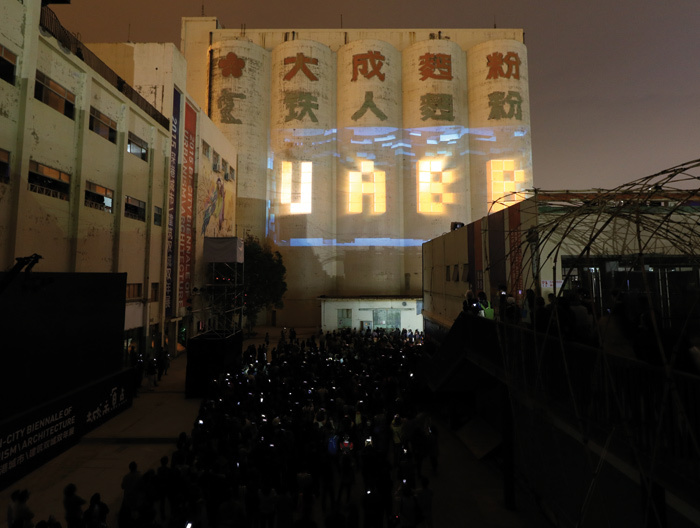 Herbert Wright travels to the Aaron Betsky-curated event, finding it well worth the trip, even just to see where China’s unprecedented urbanisation has led. On the super-shiny futuristic Shenzhen Metro, video ads looping above the seats unexpectedly flash a phrase in English. 'Let's Take What Is Here' the screen proclaims, showing a scene of earth and brick. 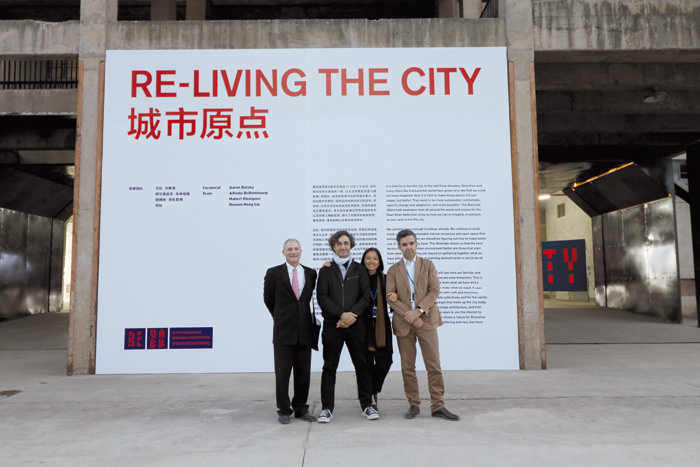 The message is from Shenzhen's Urbanism\Architecture Bi-City Biennale (UABB). And it's at the heart of chief curator Aaron Betsky's view, voiced at the UABB opening press conference held deep in Shenzhen's cinematically sweeping Civic Center (2004, designed by Li Mingyi). There, sitting in suit and tie with his curators, including the wild-haired urbanist star Alfredo Brillembourg, Betsky said: 'We have built so much, maybe we have built enough. We need to think about making better use of what we already have...It's not about building...it's about breaking boxes'. Shenzhen has built so much since 1980, when just 30,000 lived there, that its population is now more than 15 million (a third with no residential status) and building won't stop any time soon. This is a super-modern metropolis of freeways, malls, world-class skyscrapers, countless cliffs of housing and super-tight urban villages. It has the scale of Los Angeles, the dynamism of Dubai and, despite Brillembourg's assertion that 'it's still missing the layers that make it a real city', zones with the buzz of Tokyo. There's almost nothing that's not in motion. One exception was the Dacheng Flour Factory, a disused facility from the Eighties at Shekou Port, almost an hour's Metro ride from the centre. Now, it hosts UABB. Echoing the UABB ethos, Doreen Heng Liu, principal of local practice NODE and the only Chinese in the line-up of eight curators, has done a complete repurposing of all the buildings. She opened a walk-through of its silos and their cylindrical yet cathedral-like verticality, and added newbuild with a light touch, including a 200-capacity auditorium. Further, she personally curated the vital local exhibition section, called PRD2.0. It addressed the subject to hand: the rapidly urbanised Pearl River Delta, (PRD) which has 40 million-plus people, accounts for more than a third of China's trade, and in which Shenzhen is just a part. UABB was as much Liu's show as anyone's. Before looking at what was presented at Shekou, what of other locations? After all, one of UABB's initials stands for Bi-City. Never referenced, the other city is actually Hong Kong, just across the water. Betsky said merely that its theme is different and it 'doesn't have as much funding as Shenzhen'. And there was more in Shenzhen itself... sort of. To the surprise of the city representative at the press conference, another location was denounced by Betsky as 'not part of our Biennale, we recommend you do not go there'. Obviously, that would make it a must-see, but the long Metro ride to the Xipu New Residence at Longgang in another distant suburb defeated the temptation. Betsky later told Blueprint that there 'the developers decided to turn it into a theme park'. If Dacheng was also something of a theme park, its theme was the UABB's official one, 'Re-Living The City'. 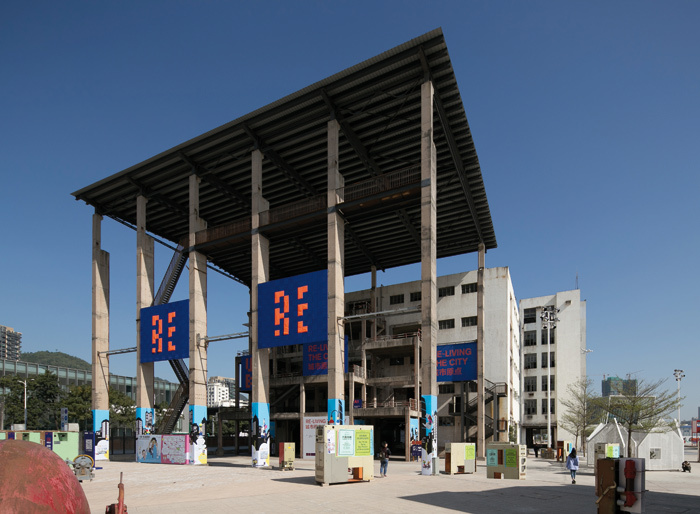 RE in fluorescent letters emblazons banners on the frame holding a huge new steel canopy over the entrance and step-out platforms that front Building no 8, 16,000 sq m of cleared-out concrete warehouse. It is now the main exhibition venue, pregnant with extraordinary ideas over three floors. The ground floor presents Social City, a section curated by Renny Ramakers of Amsterdam design house Droog. 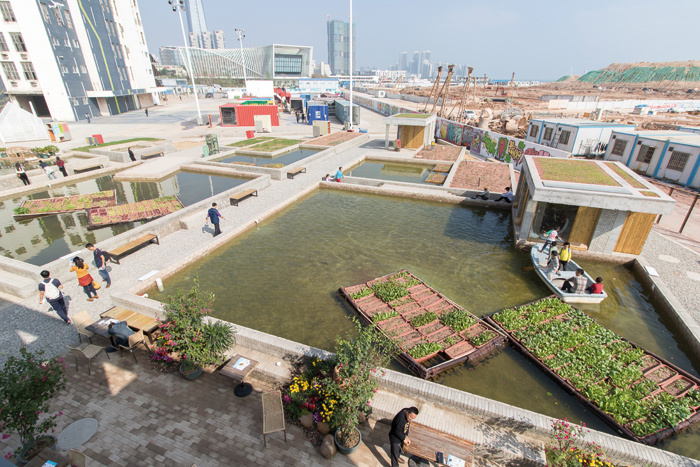 Four Dutch installations about Shenzhen and Hong Kong illustrate its thesis that urban planning needs new, inhabitant centred tools. 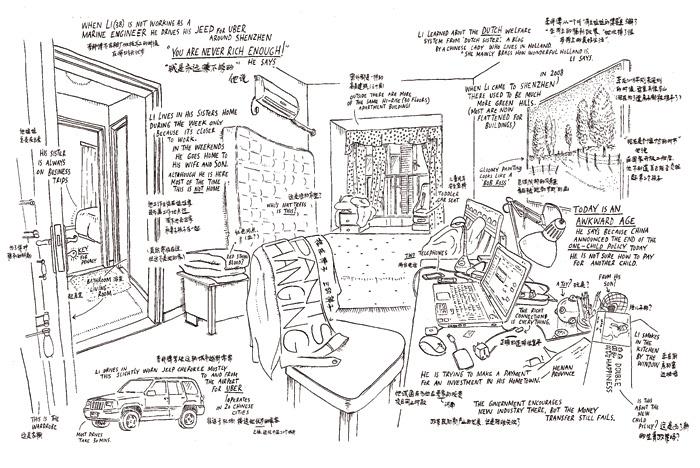 There is contrast between Jan Rothuizen's intimate line drawings of four Shenzhen domestic interiors, with hand-written labels for things as small as a key, and Mark van der Net's dynamic digital screens driven by local social-media activity. Beyond Social City is Collage City, curated by Betsky himself, a zone of several, mainly organic, installations made of found materials. Such are what humanity lived in before architects appeared, and many still do. 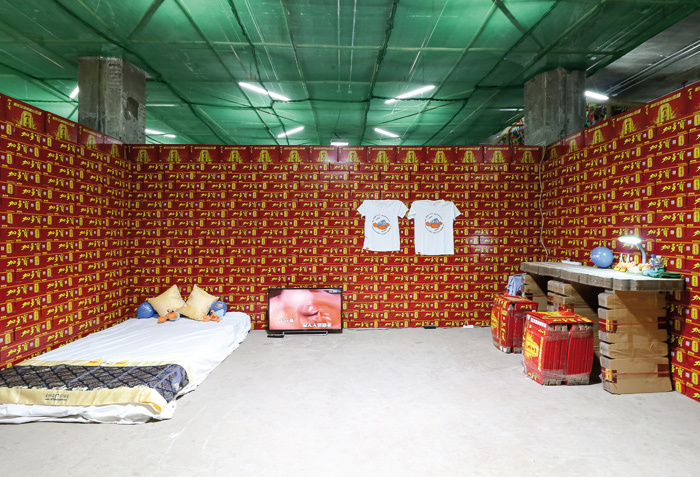 Guangzhou-based artist Feng Feng's outstanding Check In is a single-room habitation, including a bed and desk, made entirely of Jia Duo Bao herbal-tea packing boxes, which gives a pleasing Warholian aspect. One wonders if Betsky would have preferred it to the Shekou Hilton, of which he said: 'I feel guilt for staying there'. 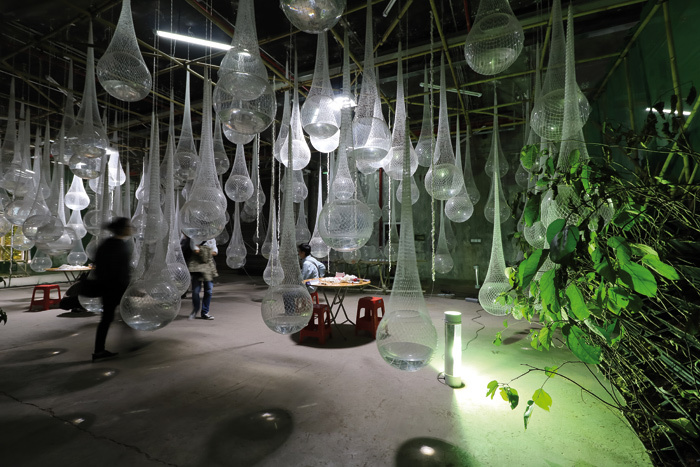 Studio Hood's Symbiotic Village, in which spheres of water hang like giant tears from a bamboo frame, is atmospheric and references the PRD's age-old symbiotic relationship with water. By contrast, LA-based Studio Spectacular's Lost and Found glowed with super-modernity. 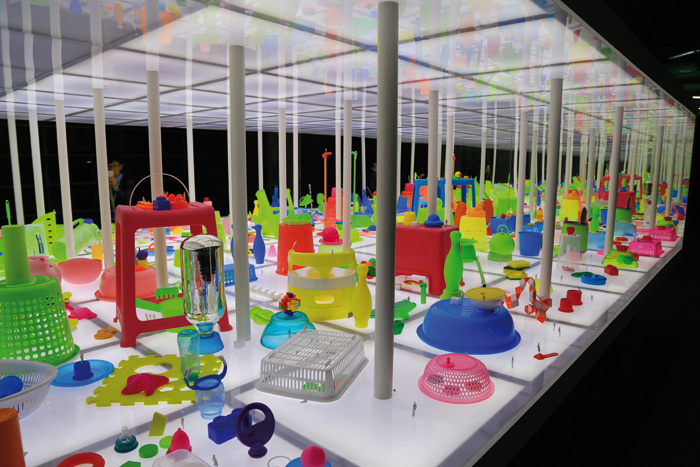 In a 4m-wide frame (referencing the raised podium of OMA's Shenzhen Stock Exchange skyscraper as if it was Archizoom's horizontal stage in No-Stop City) were strewn brightly coloured made-in-China plastic objects (referencing American 'big box' stores full of Chinese goods). Look closely, and there are also tiny human figures. Blueprint asked Studio Spectacular's Jiminez Lau if, like Fujimoto's at the Chicago Architecture Biennial (Blueprint 342), they addressed scale in architecture. Yes, he said, both works have 'architectural qualities seen in the juxtapostion'. Things get serious on the first floor up, split between the heavyweight shows Radical Urbanism and Liu's PRD2.0. The latter's is an expanse of models, diagrams, photographs and words by 19 contributors. There is documentation of life, such as Crawford, Hirsch and Tang's study of urban-edge villages at Panyu, and meticulous architectural dissection of local housing, in Megablock Urbanisms by a team including Asia Megacities Lab and Jeffrey Johnson of Columbia University and separately, Hong Kong Typology by an ETH Zurich team. Seoul-based WISE Architecture made a model of Building no 8 and filled it with boxes showing local facades in The City that Re-lives its Memories. The Shenzhen studio Urbanis speculated about its home city as Hypermetropolis, including a cityscape montage with the colourful whimsy of Archigram -- and won the silver prize from the UABB's Independent Jury (which included Peter Cook). Most fun is Feng Yuan's Wealth Architecture, of fancy mansions as fish-tank features. Two in PRD2.0 took future Shenzhen out into the water. The city has great parks, but maybe you can never have enough, and Beijing-based starchitect Ma Yansong of MAD proposed cutting off a container port isthmus at Qianhai Bay to make the rectangular Forest Island, with cultural and sports centres. More rectangles in water were proposed in Floating Fields by Thomas Chung of the Chinese University of Hong Kong -- a myriad of agricultural fields floating in the bay. But Chung goes further, actually building shallow partitions outside, some filled with water on which float such rectangles, packed with growing boxes. He demonstrates a multicycle ecology concept, including mulberry dyke ponds with duck and fish, aquaponics, algae cultivation and water filtering. It's complex, surprising, serene and green. Frankly, this should have won a prize. Back in Building no 8, there was much more to fascinating, overwhelming PRD2.0... just like the PRD itself. By contrast, Radical Urbanism sampled the planet, and was the most overtly political section, raising issues of inequality and control. Curated by Brillembourg and Hubert Klumpner, both now at ETH Zurich, it included urbanist studies of phenomena in Cape Town, Sendai (Japan), Santiago and New Jersey, and distributed phenomena -- Rotterdam historian Crimson considered spontaneous street protest, for example, while Anna Heringer, Martin Rauch and Mu Jun's Urban Earthworks called for rammed earth, not concrete or steel, as construction material. 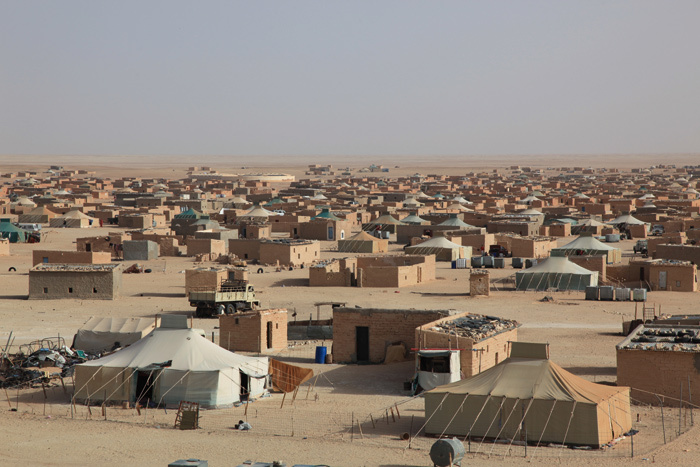 Refugee Camps of the Western Sahara, by Manuel Hertz Architects, documented the Sahrawi settlements in the disputed quasi-nation, in particular its de facto capital El Aaiun. This arid collection of makeshift structures is solidifying, finding rules, and asserting nationhood. That show won the dragon-shaped UABB Golden Award. Betsky, however, told Blueprint that 'the presentation is not what I would have picked' -- his choices would have included Alexander Eisenschmidt's Collective City, a detailed study of the ingenuity in cities adapting in non-standard ways to particular local pressures. On the third floor in Building no 8, the National Pavilions section seemed random. Ireland was among the few there, with a display called Shan-Zhen, based on a claim that Shannon (pop. 9,500) was directly behind the birth of Shenzhen. Well, that sounds like a fine new Irish fairy tale, like the Corrigan Brothers claiming Obama as Irish in 2008... but the Irish produce the evidence! Shannon was made a Free Trade Zone in 1959, and when Deng Xiao Ping unleashed enterprise in China, that was of interest. 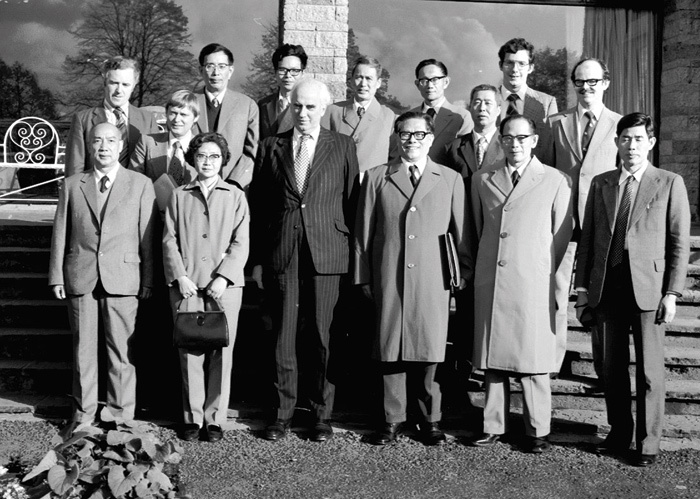 In 1980, Jiang Zemin, later to be president, led a delegation to Shannon, and there's a photograph of him grinning proudly there to prove it. Shenzhen was declared a Special Economic Zone that very year. Irish practices AP+E and Urban Agency created a space within a translucent curtain to air community recordings from both places. Betsky himself cited the quality of the Union of Architects of Russia crisp, colourful banner displays showing imaginative visions for repurposing Russian industrial heritage. Though not a national pavilion, the UK was there in Unidentified Acts of Design, in which the V&A mounted a 'test ground' of its work tracking down non-studio design in Shenzhen. The museum will collaborate with the Fumihiko Maki-designed Shekou Museum, to open next year. The V&A's Brendan Cormier says 'it's a new model, an experiment to engage with a Chinese museum', and he and Luisa Mengoni, also from the V&A, see parallels addressing industrial design from the 'factory of the world', which England was and the PRD is now. Getting down to the nitty-gritty of these emerging artefacts won them the UABB Silver award. Exhibitions were in other buildings too. Sharing a block with the very-hipster Reliving Coffee Bar was Maker Maker, displaying artworks curated by Benjamin Ward. 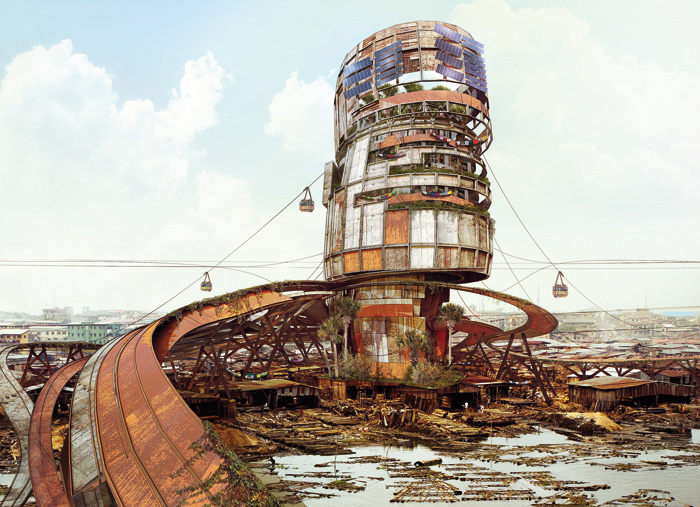 Notable among them was Olalekan Jeyifous' Urban Assemblages, montaging a rusty, curvy superstructure into developing city landscapes; Parlay -- Curtis Anthony Parlaitin's hanging sneakers made of wire; and Marina Formenko's installation of discarded electricals and electronics, e-white. Outside, there was a whole container village for the Collateral and Sponsors' Exhibition, with contributions from conceptual to corporate. Two early keynote addresses to a packed auditorium stand out. Photographer Iwan Baan took us through his photos of African brutalism from the decolonialisation times, speaking simply and spreading his love for the buildings, already disappearing into new developments. Chengdu-based architect Liu Jiakun presented his work Rebirth Brick, made following the 2008 Wenchuan earthquake in Sichuan from salvaged rubble (Wang Shu's Ningbo Museum also reused bricks that year, but whole, not earthquake-sourced). Liu Jiakun's back-to-basics and steely but emotional approach, not always with the authorities onside, was inspiring -- and chimed with Betsky's themes. After Liu Jiakun described his rehabilitation of a Chengdu housing estate, Peter Cook was so enthused he waved his arms as he praised its ramps. Like Sarah Herda and Joseph Grima at Chicago's Biennial (Blueprint 342), Betsky urges architects to have a wider scope of practice, something he's been arguing 'for quite some time'. While curating the 2008 Venice Biennale, his theme was Architecture Beyond Building. There is a feast of that at UABB Shenzhen, and it's spot-on in subsuming architecture into urbanism. His call is for a new urbanism. It's worth the trip to Shenzhen anytime, just to see where China's unprecedented urbanisation has led. But to see the alternatives it could lead to, anywhere, take the sci-fi Metro ride out to UABB.